I pressed my first palette! - Cherry Colors - Cosmetics Heaven! I pressed my first palette! Some time ago, I ordered the Ez Prez and a palette from Coastalscents... and well my pressing experience wasn't that great (I was using a too big coin, so it got stuck!). But after some tips on how to get the excess liquid out, I managed to get a perfect palette! So this is before, you can see it's not pressed. 1st row: LimeCrime Mirror Mirror, Fyrinnae Fire Opal, Fyrinnae Polar Bear, Fyrinnae Mephisto. 2nd row: LimeCrime Medusa, GOSH Sea Me, Fyrinnae Aztec Gold, Fyrinnae Freya. 3rd row: Fyrinnae Dressed to Kill, LimeCrime Princess Caraboo, LimeCrime Twilight, Fyrinnae Dokkalfar. The pressing was very messy (don't ask how does my bf's bed look like now :D). 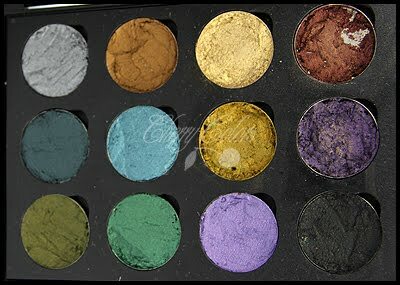 Did you ever try to press any mineral eyeshadow?